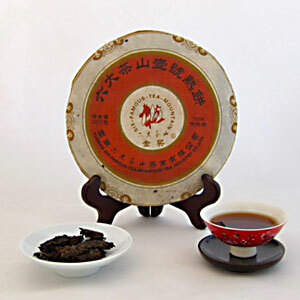 Produced by Yunnan Six-Famous Tea Mountain Tea Industry Co., Ltd., this tea won the Gold Medal at the 4th Annual Guangzhou International Cultural Festival Pu-erh Tea Competition in November 2005. Fermented relatively lightly, this tea is less earthy than most traditionally processed ripe pu-erhs and is simply delicious. It leaves a nice sweet aftertaste after you sip the tea. The cake is organic certified by Certified-Organic OFDC China. Use 5g of leaves per 6g of water. Use boiling temperature water (212 degrees F) to briefly rinse the leaves and discard the water. Begin steeping the leaves according to the suggested times below. I prefer darker earthy sho pu-erhs so I was not sure how I would enjoy this lightly fermented tea but I am thoroughly impressed. It is my favorite tea at this time. This is a full bodied, smooth, smokey tea! Wonderful!